The low above us offered us a nice boost and great sailing with 25kn from behind. Winged out we made good progress. Lows are typically stronger on the northern side in this hemisphere and rotate anti-clockwise, unlike the southern hemisphere which rotate clockwise. 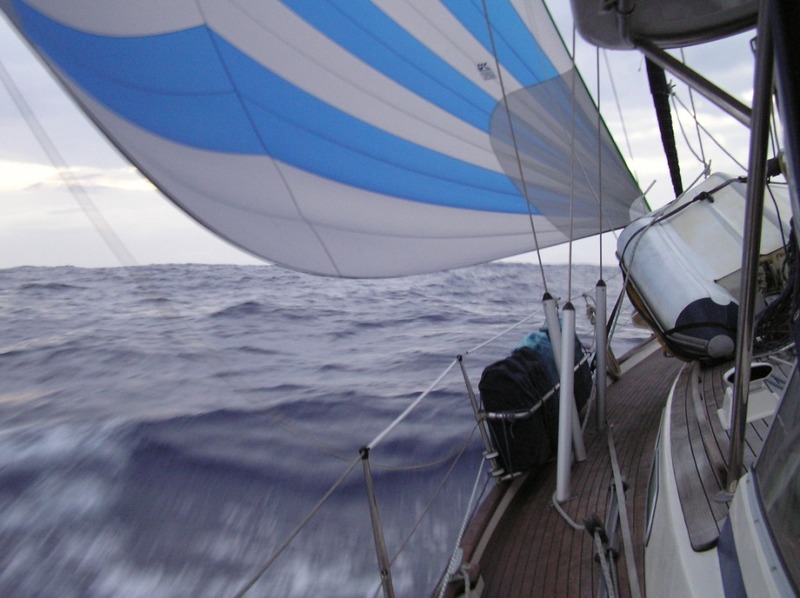 Yesterday the sails remained winged out as we sailed on the southern edge of the passing northerly low on a direct course to the Azores. Last night the high pressure ridge overtook us; winds up to 25kn and rain, still winged out which made for an uncomfortably rolly night. The ocean temperature is around 23degrees matching the daytime ambient temperature. Socks and beanies are worn during the night to keep cosy in the cool ocean nights. Spinny got plenty of air-time during our voyage. Light winds today (8-12kn) but with our blue and grey spinnaker flying high, our speed kept respectable, only snuffing the spinny at dusk in anticipation of stronger winds overnight. There’s a nasty blow developing to the north above 34degrees with strong easterly winds; disastrous for any vessel trying to sail east (like us!). So our plan is to stay below 33degrees and take advantage of the lighter westerly wind, making our move north once the nasty has blown to another latitude. 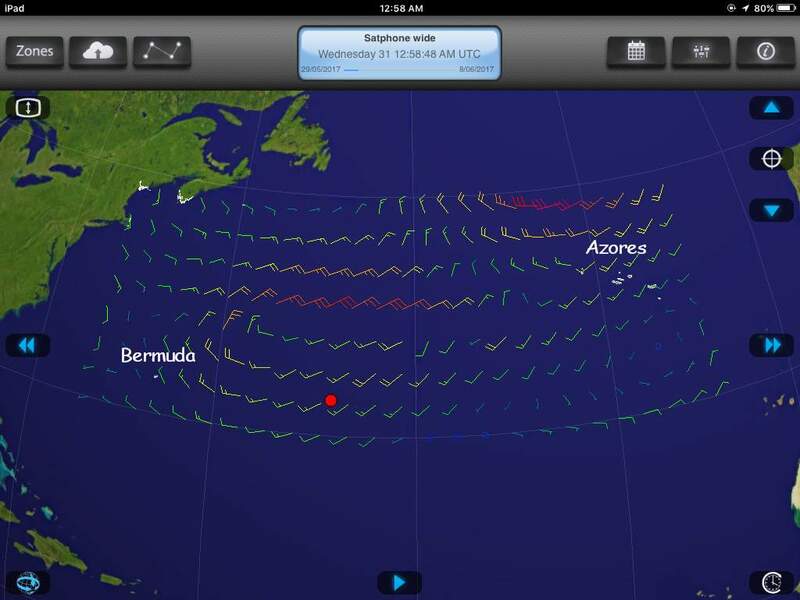 Each morning I speak to eight other boats scattered some 1500nm apart. The first of our group, ‘Felix’, is planning to arrive at Flores island in the Azores sometime on Wednesday after 18 days. The vessels ‘Nostress’, ‘Inish, and ‘Fenicia’ will arrive over the next few days; ‘Emil’ and ‘Inishnee’ are well ahead of us, while ‘Coruisk’ and ‘Sara 2’ are bringing up the rear, about 500nm behind us, last heard they are motoring along with no wind. It’s good to have a chat each day with everyone to find out how they’re going. For us, today the wind piped up to 25kn and the day was bright and sunny. Hair washing day! 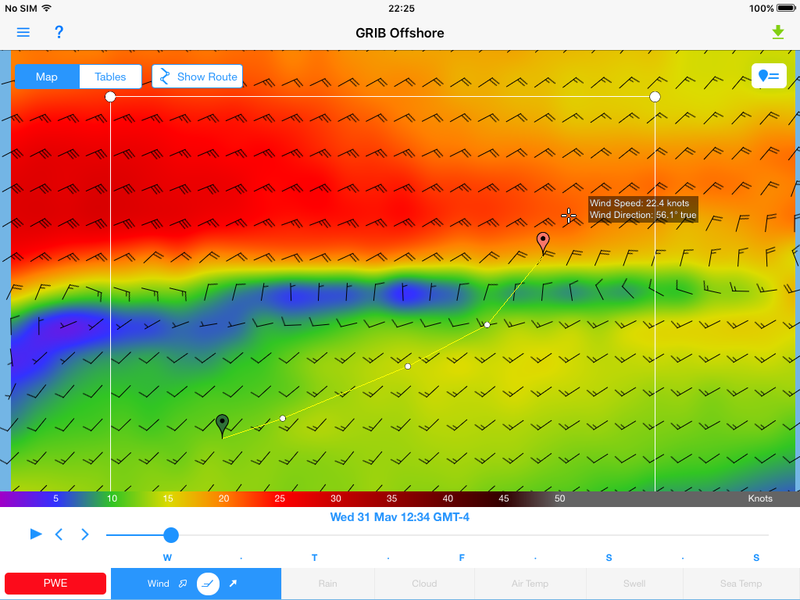 Surfing all day down 2-3m seas gave us a great boost east. This PredictWind forecast shows a nasty blow to our north. Isn’t it amazing how defined the two wind directions are? There’s no way we wanted to bash into 25kn winds so we maintained our easterly course for two days until the winds shifted to the south east, as can be seen by the following image. Much better! Once again I’m sitting in darkness just after midnight UTC. For a few hours the light from the waxing moon highlights the waves around us before it disappears leaving me again in total darkness, except for the dimmed glow of the boat’s instruments and my iPad. The moon will get brighter and hang around longer each night as the full moon develops over the coming week. 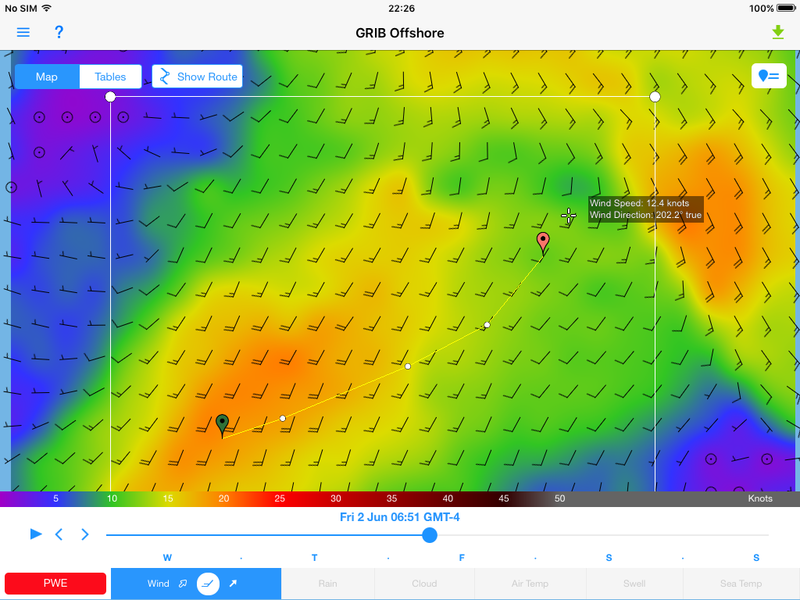 Today we expect the wind to ease a tad and we will begin our course further north. Date/time(UTC)/position: Wednesday 31st May 2017 / 0000UTC / 32*14N 051*18W.